Whether you have back pain, neck pain, or pain coming from anywhere else in your body, you want instant pain relief. Living with pain is unbearable. When your body is hurting, it is hard to focus on anything else. Pain can occupy a whole lot of room in your mind, and if not managed, it will have detrimental effects on all areas of your life. Whether you need advanced pain management or pain relief, consider Alpha-Stim. 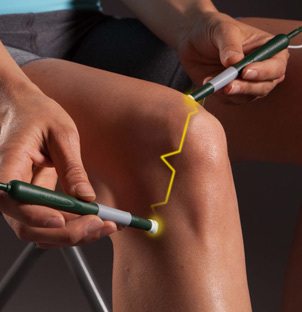 This medical device will safely and effectively offer the instant and ongoing relief you need. Independent studies have confirmed it. There are so many options for treating pain, how do I choose? If you’ve read the news in the past year, you’re probably aware of two other common side effects from opioids and other pain management drugs: addiction and drug interaction issues. That’s why Alpha-Stim is so effective for a wide variety of people including veterans, cancer patients and aging adults – it carries none of these side effects yet is fast, safe and proven effective. What are the best non-opioid options for pain management? There are multiple non-narcotic approaches to pain management, including aspirin, meditation and physical therapy to name a few. Each has its own success rate and research (or lack thereof) to add credibility. 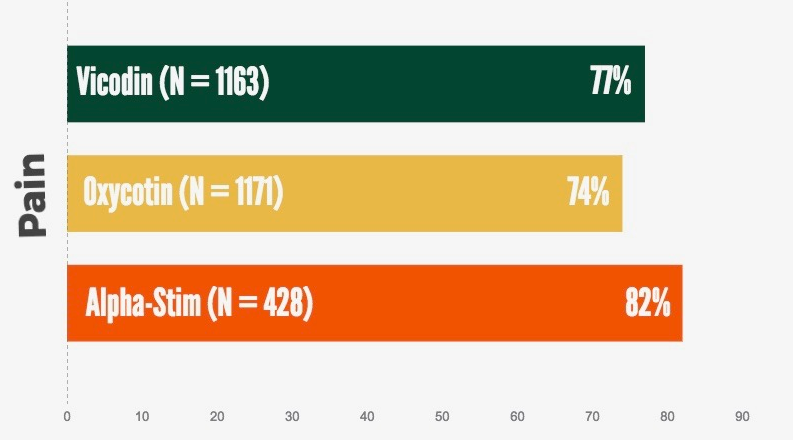 Dozens of independent clinical studies have proven that Alpha-Stim not only provides fast pain relief, but it also effectively manages chronic pain. So, what is Alpha-Stim and how does it work? The pain sensation transmits through your body along billions of nerve cells designed to transmit pain messages through electrochemical signals. The Alpha-Stim M electrotherapy stimulation device uses a microcurrent waveform that modulates the signals within the cell to provide significant pain relief and pain management without medication. Applied to the site of pain using hand-held probes or attachable electrodes (probes for a quick treatment that takes less than 5 minutes), the Alpha-Stim M offers non-invasive, fast relief of many types of pain, including acute, post-traumatic, and chronic pain. Alpha-Stim is an effective form of pain management designed to help you avoid or reduce the need for pain medicine, but it is safe to use with prescriptions or over-the-counter medications, if needed. 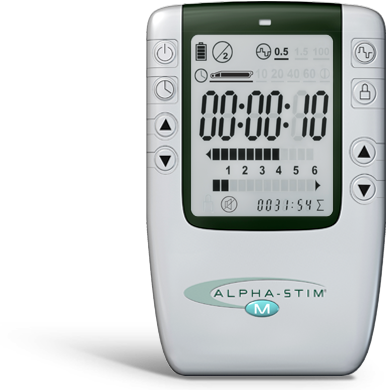 The Alpha-Stim® M is a handheld, prescription electrotherapy device that delivers advanced Microcurrent Electrical Therapy (MET) to your pain site through an exclusive, patented waveform. 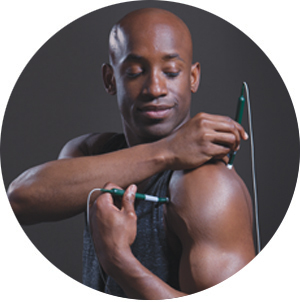 This uniquely refined and researched waveform provides non-invasive, sustainable pain relief and pain management wherever and whenever you feel discomfort. The Alpha-Stim M electrotherapy device can also deliver Cranial Electrotherapy Stimulation (CES). CES is proven to relieve the anxiety, insomnia, and depression that often accompany pain. Can Alpha-Stim help me handle chronic, severe pain and work effectively? Absolutely. Used regularly, non-narcotic Alpha-Stim will provide chronic pain relief and you can even decrease use of it over time. Alpha-Stim is more than just short-term pain relief. It is an advanced pain management device that will improve your quality of life for more than a moment. Control your pain. Don’t let your pain control you. We use the Alpha Stim unit for a range of post-traumatic pain secondary to soft tissue, bone and nerve injuries and have had good success. It is a safe, efficient and clinically effective tool that we now use on a regular basis here at Everton Football Club. Our hospitals are doing some really exciting things to combat chronic pain and take care of our veterans. There are VA hospitals that are using alpha-stimulation devices to treat pain and depression. That’s only going to continue and keep getting better. And we are getting there. As far as the Dallas Cowboys are concerned, Alpha-Stim has stood the test of time yet remains at the forefront of electromedicine. This treatment has changed my life and has given me my weekends back. Thank you for this gift, Alpha-Stim. For immediate pain relief…Alpha-Stim has no equivalent. There is no modality available that will give as quick and profound relief. The Alpha-Stim device is easy to use and has been well received by our players. The consensus here has been very positive. With the help of Alpha-Stim, I can now go up and down stairs like a normal person—without the pain and discomfort that I have had since 1942. Alpha-Stim has proven, over time, to be my reliable source for relief. It eliminates my severe and chronic pain, and restores a welcomed and peaceful sense of well-being. The Alpha-Stim has changed my life: after a decade of debilitating pain, I can walk, sleep, and function again. I have never been more grateful for this life-altering device that helps me deal with my pain. Alpha-Stim truly has improved my quality of life by 1,000%. I would highly recommend the use of Alpha-Stim to anyone; it has helped me to experience less pain and enjoy life every day. With Alpha-Stim, I am confident I will be able to function normally once again, without any side effects. Alpha-Stim got me over ‘the hump’ and made pain manageable…with continued signs of improvement. Thank you for helping me take my life back. In 2006, I was seen by a pain specialist and was prescribed the Alpha-Stim. Since then, I have used it with considerable lessening of pain severity, frequency, and duration. To all who suffer from the detrimental effects of injury, insomnia, or depression: I whole heartedly applaud and recommend Alpha-Stim to you! I personally plan to utilize the Alpha-Stim product as often as possible. I would just like to tell anyone with chronic pain problems to try this machine. It really works. I get daily relief from pain and my condition is improving, thanks in part to Alpha-Stim. It gets me through my day! My car accident left me with injuries that I continue to battle with on a daily basis. The Alpha-Stim is remarkable, and I recommend it to anyone that wants their life back. I used the Alpha-Stim for about 8 weeks. The effects were amazing and helped reduce the pain length, severity, and frequency. Several months back, I had severe pain and was unable to walk for over two months…I started to use Alpha-Stim, and in two days I was pain free. It has made such a difference in my life. Tan G, Rintala D, Jensen MP, et al. Efficacy of Cranial Electrotherapy Stimulation for neuropathic pain following spinal cord injury: a multi-site randomized controlled trial with a secondary 6-month open-label phase. Journal of Spinal Cord Medicine. 2011; 34(3):285-296.